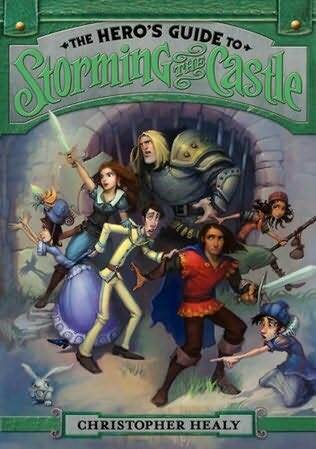 In attempts to catch up with summer reading reviews, I am pleased to share The Hero’s Guide to Storming the Castle by Christopher Healy. This is book #1 in the League of Princes series and a creative look at some familiar stories. In the story, Healy introduces us to several Prince Charming characters and their princesses from four popular fairy tales/Disney movies – Cinderella, Rapunzel, Snow White and Sleeping Beauty. Even though it shares the basic premise of the storybook love stories, this slant portrays a very different, and hilarious, depiction of what really happened. Each character is presented with backstory, quirks, flaws and desires. As a parent reading with my 9 year old, I found myself laughing out loud along with my son. Healy is gifted at bringing the reader into this world and to pull for the “heroes”. Another bonus is princesses are more than just a pretty face, they are very strong female characters girls can look up to. In the book, the four Princes Charming are trying to save royal bards from a wicked witch. These song writers have written each of their stories with one major thing left out – their actual name. While the princesses are the focus of the tunes, the princes are cast as the generic prince and they despise it – but it brings them together. Their quest to storm the castle and save the bards keeps getting tripped up by their character flaws, but in the end they accomplish their goal of defeating the witch. In what seems like a redemption of their names becomes just another blow to their egos – leading to the second book, The Hero’s Guide to Storming the Castle. Go out and pick up the two books (teaser: half way through book 2 and it does not disappoint) and look for book 3 in spring 2014.